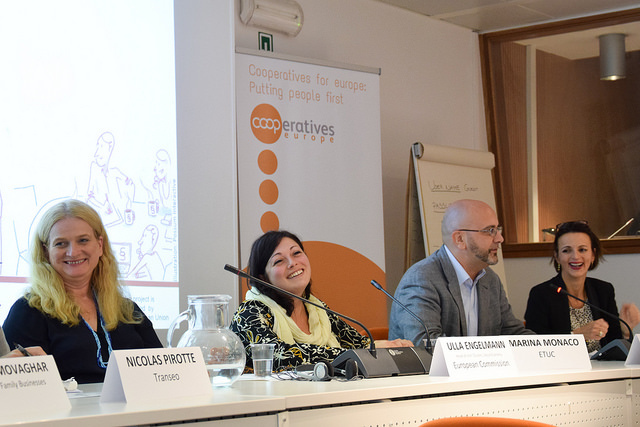 “TransfertoCOOPS: Business transfers into worker cooperatives in Europe” conference took place in Brussels on 11th of September, gathering cooperative experts, business associations as well as representatives from the European Institutions. As TransfertoCOOPS project, co-funded by the European Union, is coming to an end, the conference sought to present the project outcomes and achievements, explore specific country experiences in transferring healthy businesses into worker-owned cooperatives and host a debate between relevant stakeholders to discuss their understanding of the concept of worker-buyout, the practices of business transfers and its relevance in the current economic context. Partners from Sweden, Belgium, Slovenia and France presented the state of play of business transfers into worker cooperatives in their respective country, where projects like TransfertoCOOPS present the opportunity to ensure sustainable enterprises, SMEs in particular, and secure jobs for their employees. The situation varies drastically across Europe, from legal recognition to absence of knowledge. The project ensured a transfer of knowledge as well as more practical trainings to establish a baseline for countries where the practice is not common and to develop it further based on the successful French experience where it has already taken root. Communication tools promoted were also presented during a European campaign. The website www.TransfertoCOOPS.eu produced by the partners will be disseminated beyond the project. The website provides advice to entrepreneurs and puts future transferors in contact with cooperative mentors. The first enquiries are already coming through. The afternoon debate saw contributions by N. Pirotte (Transeo & Sowaccess), D. Movaghar (European Family Businesses), M. Monaco (ETUC), L. Martignetti (REVES Network) and U. Engelmann (HoU – Clusters Social Economy, European Commission) who respectively provided a better understanding of their views and experiences of worker-buyouts and issues of transferring businesses in Europe related to awareness raising, advocacy or succession issues within family businesses. This conference confirmed that the project has served as a springboard for developing future actions and discussions on the topic. Cooperatives Europe with partners and members will continue to raise awareness on transferring businesses from different sectors of activities to employees under the cooperative form, so as to make it a real trend ensuring SMEs sustainability at pan European level.